CLASS FULL! Please email to be put on wait list or to express interest in future workshop. 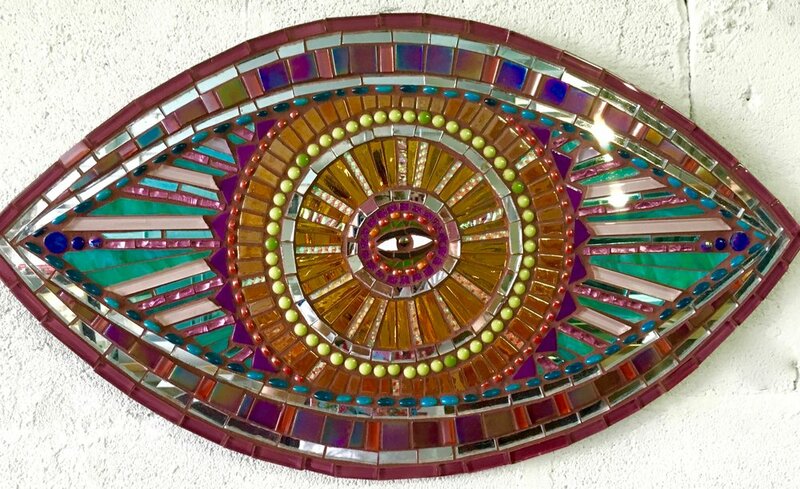 Come create a Mosaic Eye with Laurel True in this weekend workshop where participants will learn more about the symbolism and use of the eye in artwork and spiritual practices throughout history and create a beautiful Mosaic Eye to take home. In this workshop we will find inspiration in our own inner worlds and outer worlds through short guided meditations (or quiet thinking time.. whatever feels more comfortable) and prompts to help spark our creativity. Laurel will talk about how participants might imbue their Eye with personal meaning, including the use of embedded messages, color symbolism and other cosmic and practical information to help inform design approach. With this in mind, workshop participants will create a unique, personal Mosaic Eye to take home for interior display. Prepared Eye cutouts will be provided as well as a lot of cool materials to work with including mirror, glass, ceramic and mixed media. Participants are welcome to bring materials that are meaningful to them if they wish to incorporate them into their project. Laurel will present techniques she uses in the creation of her work and bring beginning students up to speed with tool demonstrations, adhesive options and mosaic setting tips including how to combine different materials. Eyes may be highly decorative or simple… personally symbolic or decorative (or both). She’ll provide some patterns as a jump start for those who want some design scaffolding for their project. Day one will be for creation of Eye mosaic and day two for grouting and finishing: painting back and rigging for hanging. This workshop is appropriate for any level student. Beginners and seasoned students welcome!